Rockstar Games has published the first official gameplay video showing off the new Grand Theft Auto V game in action. The video starts with a voiceover saying that the game developers have tried to refresh the open world game genre and then goes on to boast that "the game world is beautiful, massive and diverse, a sprawling satirical re-imagining of Southern California." The gameplay areas cover the scope of everything you might find in a real city like mountains and seaside, malls and urban areas etc. The gameplay video shows how the three game characters, Franklin, Trevor and Michael work together to take part in a heist with the player switching vantage points between the thick of the action and being in support roles; a sniper in an opposite building and a 'getaway driver' in a helicopter above. In this section of the video we see the first use of weapons in the gameplay environment. The voiceover says that this triple perspective helps give missions "new levels of diversity and intensity". Outside of missions you can just drop into any of the three main characters' lives and indulge in "a vast array of things to see and do". As well as the predictable vehicular variety for your driving and flying pleasure you can play various sports in the game like golf, tennis, cycling and big game hunting. In the game word there are lots of interesting non-player characters to meet and interact with and side missions with bounties to collect and more. Particular attention in the game development has been the focus on game mechanics "to make sure every aspect of the game is as fun and fluid as it is broad". 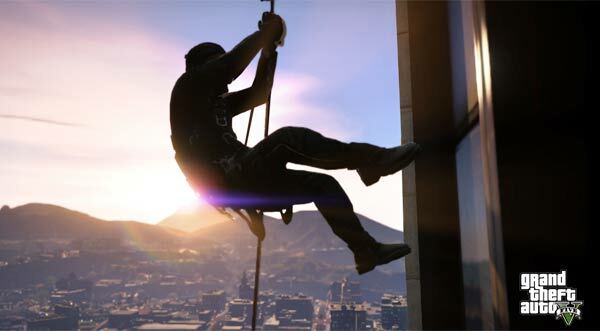 The video ends by reminding viewers that the core task of the game is to progress by completing a series of "increasingly audacious heists". These missions can be successfully tackled using a variety of strategies, methods and approaches, it's up to you and the style you want to play. The money you make from successful heists can be spent on enhancing your character and their equipment and also, we are teased, on "Grand Theft Auto online" which will be discussed in the next video coming from Rockstar to reveal more about the next instalment of Grand Theft Auto. LOL best ever .. But GTA Vice city is the best ever .. small town with less troubles .. The leisure activities look pretty awesome for a world of this scale and swapping between characters at any time is a really nice addition, I'm also very glad they seemed to have kept the Max Payne 3 shooting mechanics, now all I need to do is keep myself busy until this game comes out. Love the direction Rockstar is going in. Being able to use three heroes instead of one, having a vast area in the game to travel around and the missions, just wow, especially with how u can switch between players within the missions to help another. That is so awesome. Cant wait for it and I can see a big turn out of people for this game. wow it looks absolutely vast and they made my favourite movie into a playable interactive story!